And now, my continued chronicles of the greatest comics show on Earth, the 49th Annual San Diego Comic Con, 2018. My next set of pics and notes are dedicated to a very important part of any con; the guests, promoters, and creative people who are the prime reasons are fandom passions develop. At the show, attendees can meet, observe, sample work from, and learn of the talented people who put a lot of passion into their work. Such interaction is on the grandest scale for concentrated fandom at the San Diego Comic Con. And 2018, was especially specially and further wondrous. 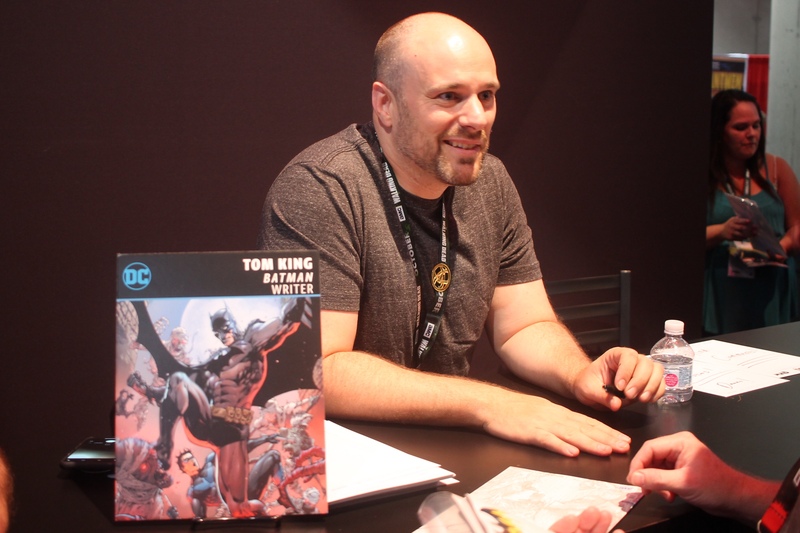 Tom King, award-winning author, comic book writer, and ex-CIA officer. Recent notable work includes the ongoing Batman run, and the Mister Miracle series. My favorite work of his, and a must read is the Vision 2016 mini-series from Marvel Comics. 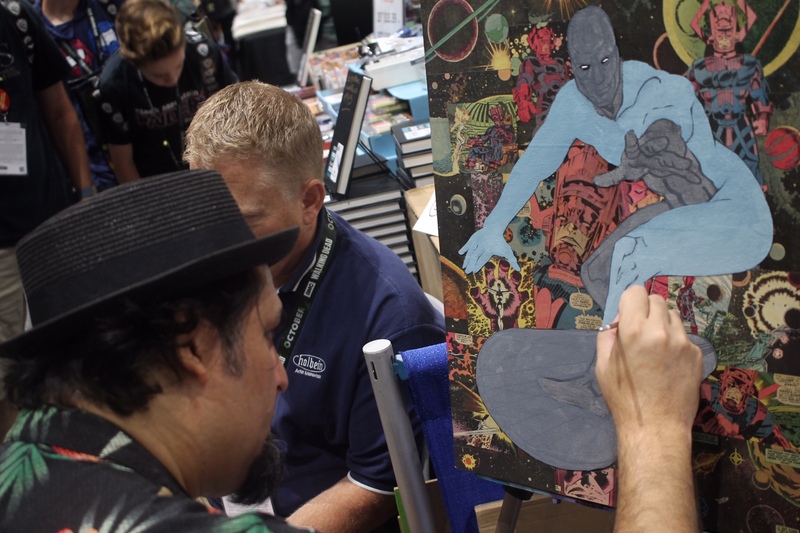 Longtime artist Randy Martinez, working on new work in the Artist Alley area of the Exhibit floor. We had an awesome chat about artistic drives, following through on work, and having fun along the way. Much of this I have recorded, and plan to share in the near future. 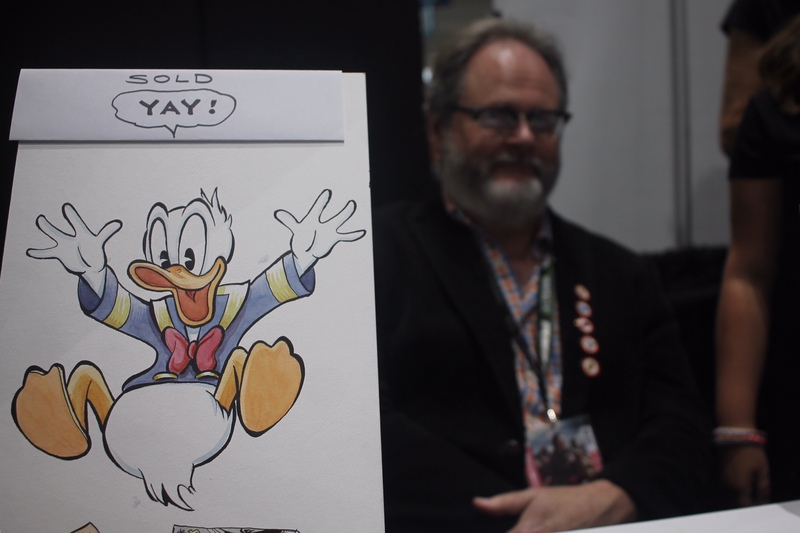 Classic Disney duck artist Patrick Block, chilled out in the artist alley. We had a fun talk, and an interesting surprise among his original art pages for sale (best to visit him at a show and see for yourself). 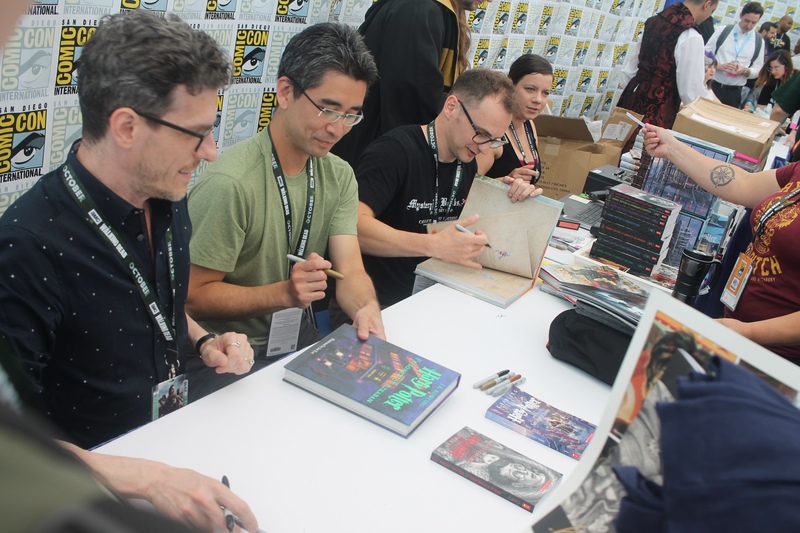 Harry Potter book Illustrators Kazu Kibuishi (15th anniversary edition cover artist), Jim Kay, and David Saylor. Elliot S. Maggin, an American writer of comic books, film, television, and novels. He was a main writer for DC Comics during the Bronze and early Modern ages of comics in the 1970s and 1980s. Kingdom Come (with artist Alex Ross) is his best work, in my opinion. Yoshitaka Amano, famed Japanese artist, character designer, illustrator and a theatre and film scenic designer and costume designer. 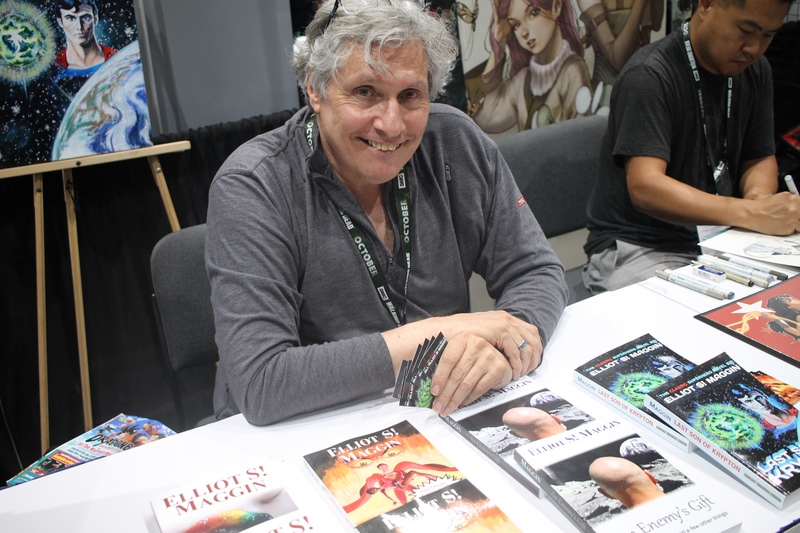 His work includes the original concept art for the most iconic Final Fantasy characters and games, the Vampire Hunter D book series, Neil Gaiman’s Sandman: Dream Hunters series, and so much more. 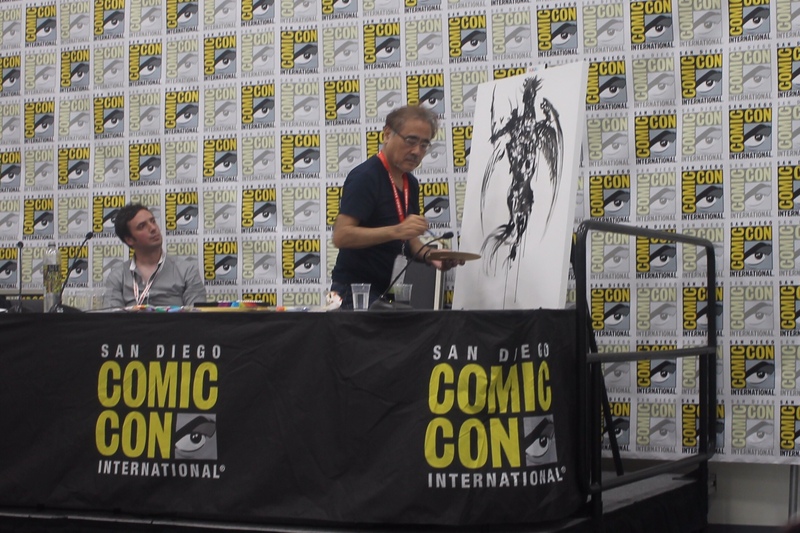 Here, Amano does live work at his SDCC panel. 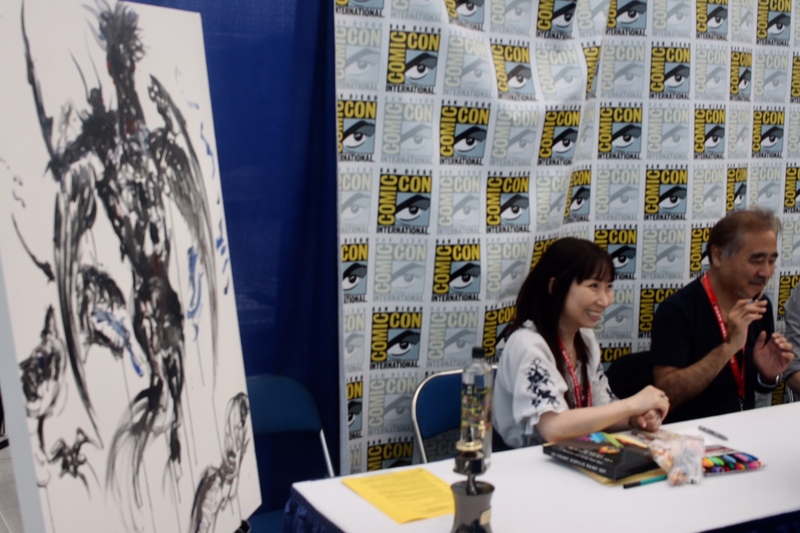 Yoshitaka Amano, later signing and greeting fans with his finished work from earlier. I got a big Final Fantasy retrospect book signed with a little sketch by him on the inside. 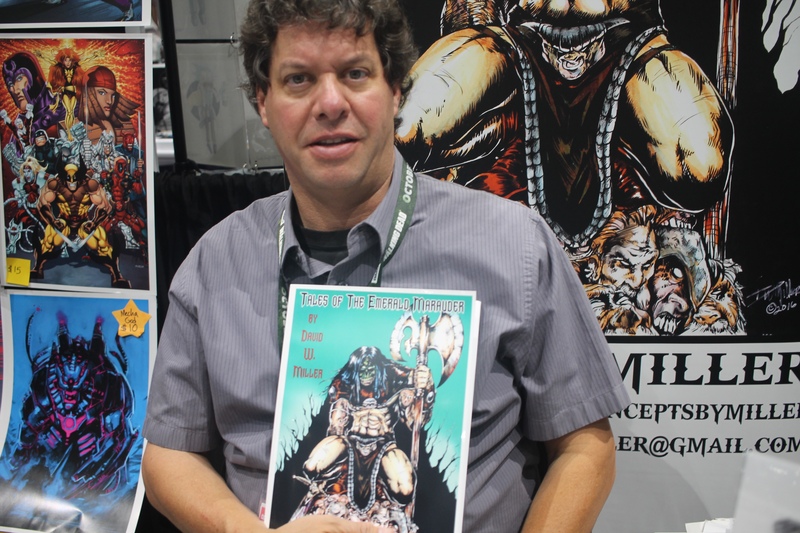 David W. Miller, longtime comics ant fantasy artist. Very passionate about this work, and doesn’t mind chatting about it. Away from SDCC floor, at the Nerdeis House special event. Here, with voice actors Gary Paulsen and Maurice LaMarshe (Animaniacs, Pinky and the Brain, many more) as they meet and greet fans. Adam Savage, from Mythbusters greeted lucky lottery ticket winners to meet and sign pictures. He said I had a kickass name! Three actors from the Amazon Prime show, Man in the High Castle. I honestly have not watched yet. I was here with a friend, a big fan of the show. There were other cast members out of frame here. Fabian Rangel Jr. proudly presents his trade paperback volume of ‘Namwolf, a highly recommended comics story about a werewolf stuck in the Vietnam War. Famed cover artist Artgerm Lau. He hosted a great a panel earlier, sharing much about himself, and the lifestyle of doing art for a living. 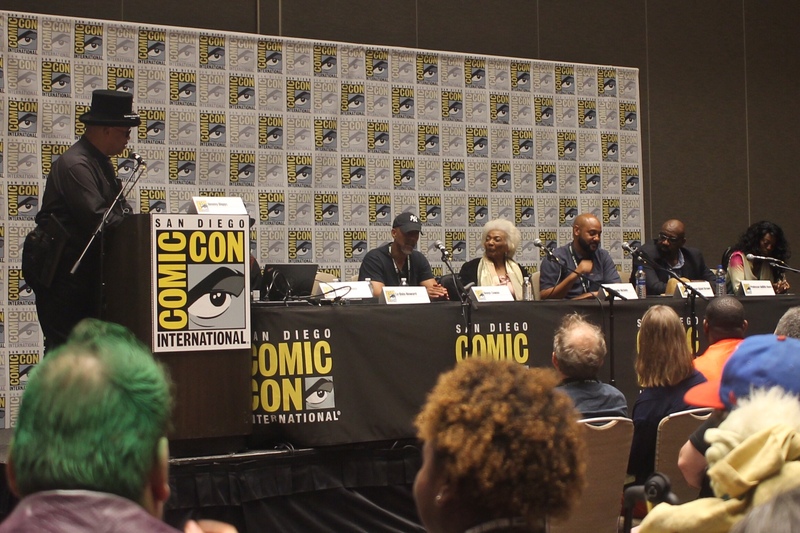 Afro-Futurism panel with Reggie Hudlin (Milestone Media, Black Panther), Denys Cowan (Milestone Media, The Boondocks), Nichelle Nichols (Star Trek, Heroes), Tim Russ (Star Trek: Voyager, Spaceballs), Kevin Grevioux (Underworld, I, Frankenstein), Professor Adilifu Nama (San Diego State University, Superheroes Decoded), Professor Ajani Brown (San Diego State University), and La Quia Howard (Kemet, I Choose 2 Be Me). Moderated by Jimmy Diggs (Star Trek: Voyager, Star Trek: Deep Space 9). Nichelle Nichols gives a quick Vulcan salute to room attendees (just missed with my camera). 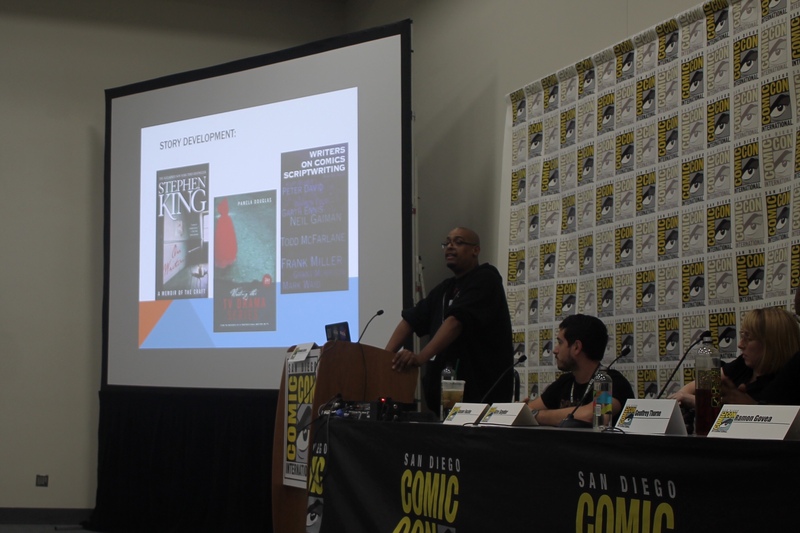 The Writer’s Journey: Maximizing Your Potential in the New Marketplace: an awesome panel for writers hosted by Brandon Easton (Vampire Hunter D: The Series, Marvel’s Agent Carter), and others sharing advice and answering questions. 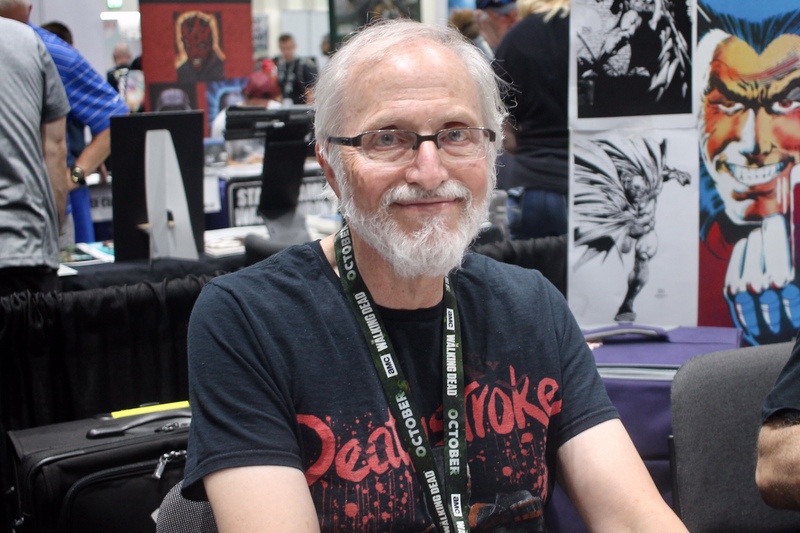 Marv Wolfman, long-time comics and TV writer, creator of the Starfire, Cyborg, Raven, Nightwing, Tim Drake, Blade, and many more comic heroes and villians. At times, he could be found in the Artist Alley area, or at one his multiple panels giving great advice on writing. 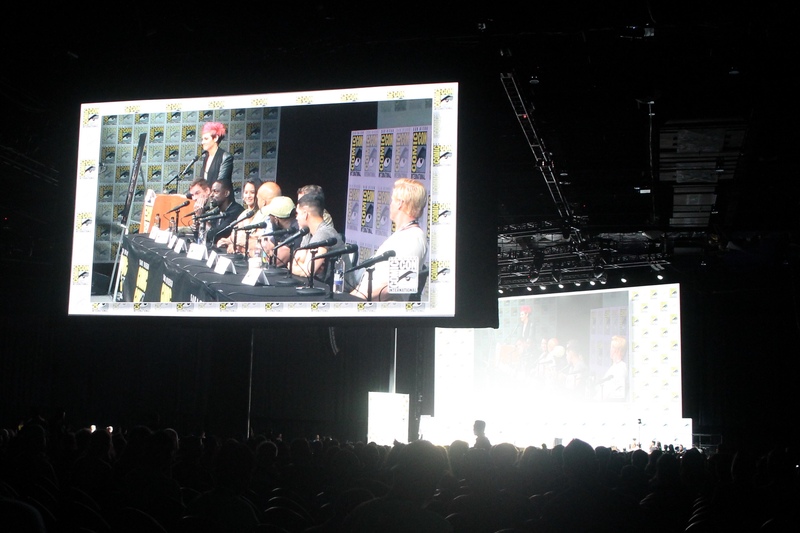 The Predator panel in Hall H, promoting the new movie, with Shane Black, Sterling K. Brown, Olivia Munn, Keegan Michael Key, Trevante Rhodes, Thomas Jane, Augusta Aguilera, and Jake Busey. Predator panel – Olivia Munn on the left, and Thomas Jane on the right. Both whom I have seen at many con panels over the years. Suddenly another aisle jammed and blocked by the WB booth, as the cast of Supernatural greets lucky fans (obtained through an online lottery system). That’s enough for now. 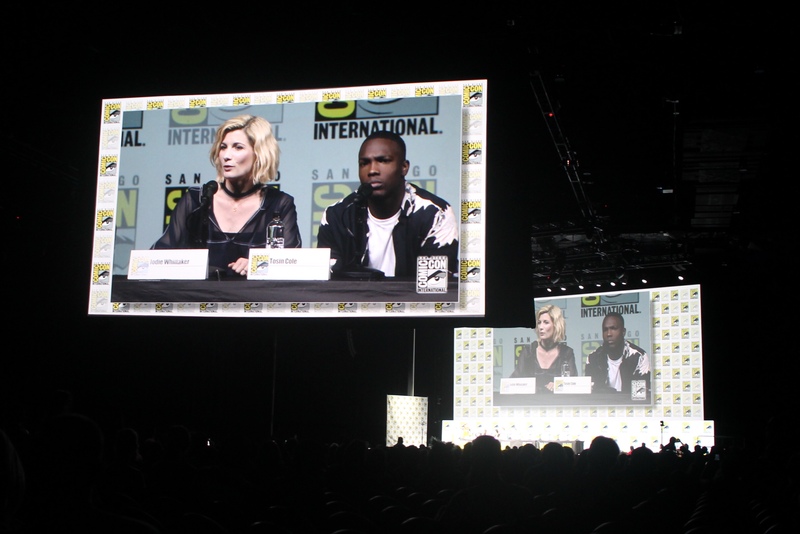 More SDCC show coverage is coming in part 3. Stay tuned to the SW, and look forward!